7351. 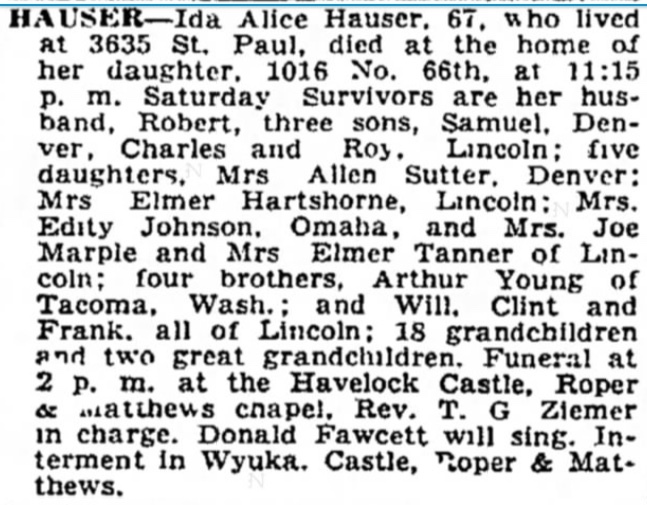 “Deaths,” Ida Alice Hauser, The Nebraska State Journal, Lincoln, NE, March 23, 1943, 10. HAUSER—Funeral of Ida Alice Hauser, 2 p. m. Tuesday at Havelock Castle, Roper & Matthews chapel. Rev. T. G. Ziemer in charge. Donald Fawcett will sing. Interment in Wyuka. Pallbearers: Carroll Tuttle, Elmer Hartshorn, Elmer Tanner, Joe Martle, Edgar Peterson Ralph Bolan. 7352. “Deaths,” Ida Alice Hauser, The Nebraska State Journal, Lincoln, NE, March 22, 1943, 8. HAUSER—Ida Alice Hauser, 67, who lived at 3635 St. Paul, died at the home of her daughter, 1016 No. 66th, at 11:15 p. m. Saturday. Survivors are her husband, Robert, three sons, Samuel, Denver, Charles and Roy, Lincoln; five daughters, Mrs Allen Sutter, Denver: Mrs Elmer Hartshorne, Lincoln: Mrs. Edity Johnson, Omaha, and Mrs. Joe Marple and Mrs Elmer Tanner of Lincoln; four brothers, Arthur Young of Tacoma, Wash.; and Will, Clint and Frank, all of Lincoln; 18 grandchildren and two great grandchildren. Funeral at 2 p. m. Tuesday at Havelock Castle, Roper & Matthews chapel. Rev. T. G. Ziemer in charge. Donald Fawcett will sing. Interment in Wyuka. Castle, Roper & Matthews. 7353. “Leona G Griffing,” Find-A-Grave, https://www.findagrave.com/memorial/18423679, 18423679. 7354. “George Wall,” Find-A-Grave, https://www.findagrave.com/memorial/190274475, 190274475. 7355. “Francis Abrahamson Wall,” Find-A-Grave, https://www.findagrave.com/memorial/150405197, 150405197. 7356. “Dorothy Jean Wall,” Find-A-Grave, https://www.findagrave.com/memorial/190274488, 190274488. 7357. “Gordon H Wall,” Find-A-Grave, https://www.findagrave.com/memorial/191520630, 191520630. 7361. “Deaths.. And Funerals..,” James M Scarbro, Beckley Post-Herald The Raleigh Register, Beckley, WV, May 12, 1968, 2. James Malone Scarbro, 70, Rock Creek, died early Saturnday morning in a Radford, Va., hospital after a short illness. Born March 2, 1898 at Rock Creek, he was a son of the late Wesley and Sarah Elizabeth Allen Scarbro. He was a retired coal miner and a veteran of World War I. Surviving are his wife, Florence; three daughters, Mrs. Opal Harless, Bloomingrose, Mrs. Lillian Markham, Rock Creek and Mrs. Virginia Holstein, Oceana; two sons, the Rev. Paul Scarbro, Prosperity and James A. Scarbro, Rock Creek; four brothers, Alfred and Wilson, both of Rock Creek, Tom, Packsville and John, Highland Park, Ill.; three sisters, Mrs. Verlie White, Whitesville, Mrs. Emma Shelton, Masseyville and Mrs. Nona Jarrell, Akron, Ohio; 20 grandchildren and a great-grandchild. Funeral services will be conducted at 2 p. m. Monday in the Shumates Branch Chapel Church at Edwight with the Rev. Thomas Bradford in charge. Burial will be in the Miller Cemetery in Rock Creek. The body will be taken from the Armstrong Funeral Home in Whitesville to the residence at 4 p. m. today and will be placed in the church and hour before the funeral. 7362. “Mrs. Josie Webb Recalls Making Spinning Wheels,” Josie Stevenson Webb, Beckley Post-Herald The Raleigh Register, Beckley, WV, August 7, 1960, 3. 7363. “Carol L Gorman,” Find-A-Grave, https://www.findagrave.com/memorial/183771049, 183771049. 7364. “Betty Louise Burwell Markworth,” Find-A-Grave, https://www.findagrave.com/memorial/155978314, 155978314. 7365. “Louis John Markworth,” Find-A-Grave, https://www.findagrave.com/memorial/155978325, 155978325. 7366. Sarah Margaret Woodall, “Texas Birth Index, 1903-1997,” April 5, 1947, Hidalgo, TX, https://www.familysearch.org/ark:/61903/1:1:VDPD-LJ4. 7367. 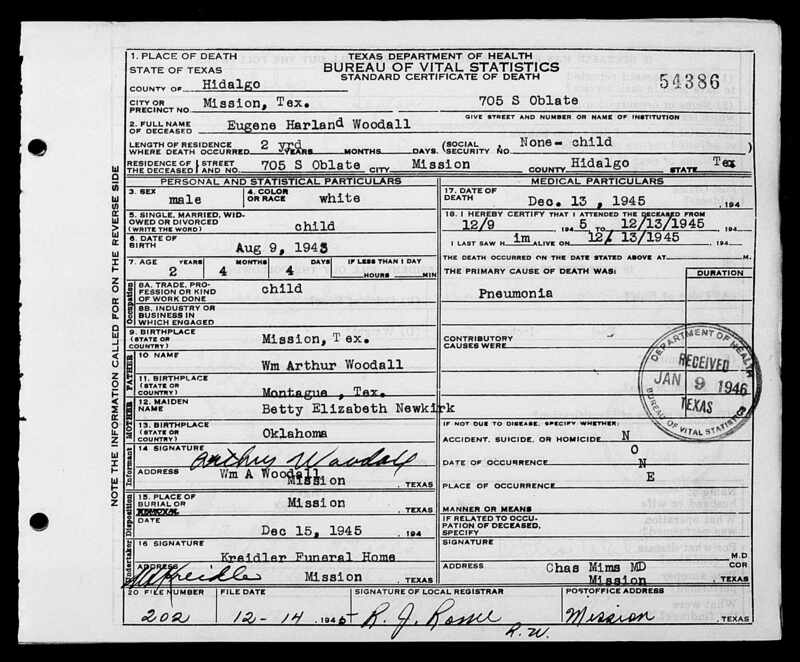 Eugene Harland Woodall, “Texas Deaths, 1890-1976,” December 13, 1945, Mission, Hidalgo County, TX, https://www.familysearch.org/ark:/61903/1:1:K393-F17. 7369. Arthur Lee Woodall, “Texas Birth Index, 1903-1997,” July 19, 1932, Hidalgo, TX, https://www.familysearch.org/ark:/61903/1:1:V8QC-691. 7371. 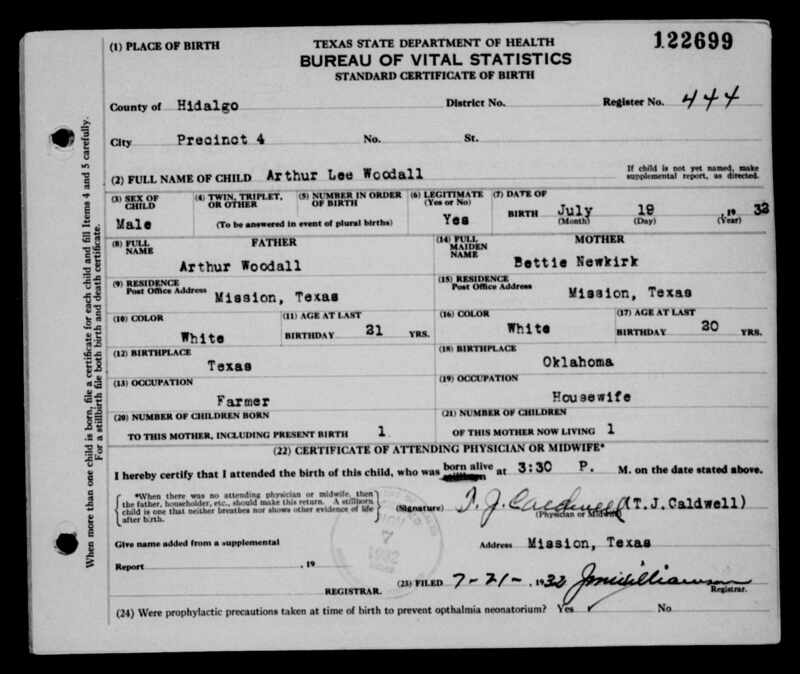 Arthur Lee Woodall, “Texas Birth Certificates, 1903-1935,” July 19, 1932, Precinct 4, Hidalgo County, TX, https://www.familysearch.org/ark:/61903/1:1:K6GK-39N. 7372. 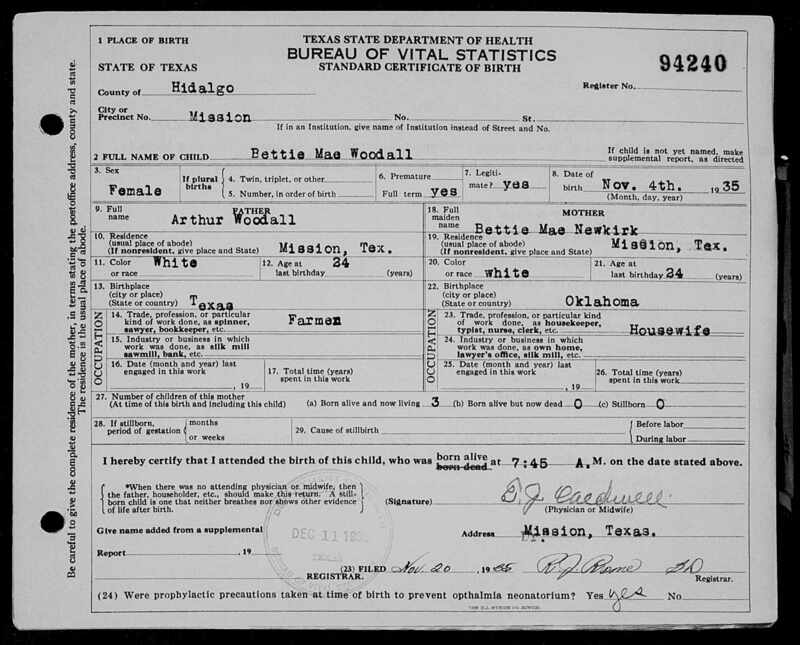 Bettie Mae Woodall, “Texas Birth Certificates, 1903-1935,” November 4, 1935, Mission, Hidalgo County, TX, https://www.familysearch.org/ark:/61903/1:1:VXGB-T72. 7373. “Arthur Lee “Art” Woodall,” Find-A-Grave, https://www.findagrave.com/memorial/148864686, 148864686. 7374. “Arthur William Woodall,” Find-A-Grave, https://www.findagrave.com/memorial/111178234, 111178234. 7375. “Betty Newkirk Garrie,” Find-A-Grave, https://www.findagrave.com/memorial/113713989, 113713989. 7376. “Jasper Garrie,” Find-A-Grave, https://www.findagrave.com/memorial/85721131, 85721131. 7377. “Edgar Lee Woodall,” Find-A-Grave, https://www.findagrave.com/memorial/104367961, 104367961. 7378. “Elmer H Woodall,” Find-A-Grave, https://www.findagrave.com/memorial/45362172, 45362172. 7379. “Rosie Woodall Underwood,” Find-A-Grave, https://www.findagrave.com/memorial/36581759, 36581759. 7380. “Dovie Vay Woodall Norris,” Find-A-Grave, https://www.findagrave.com/memorial/138083689, 138083689. 7382. 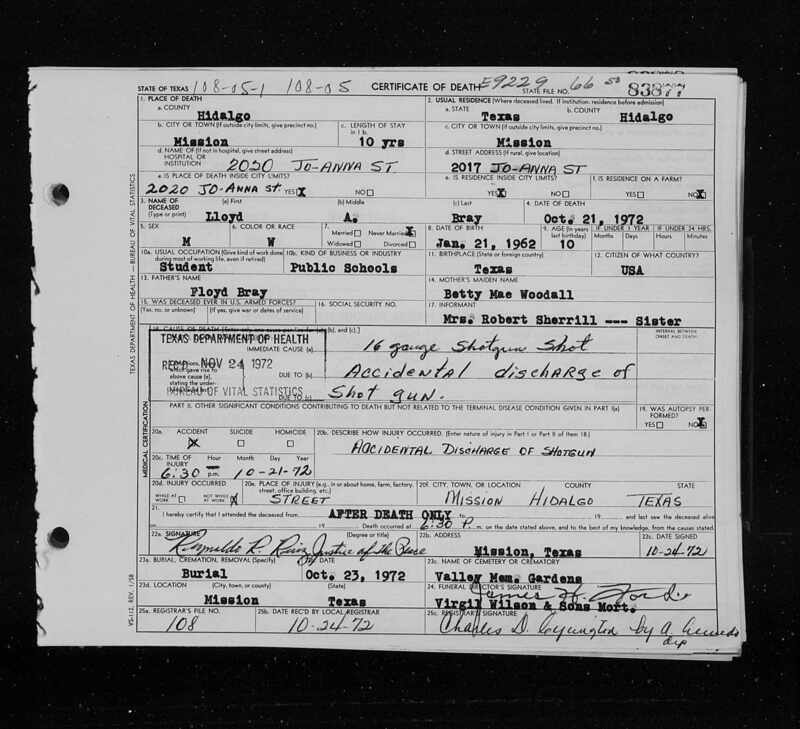 Lloyd A Bray, “Texas Deaths, 1890-1976,” October 21, 1972, Mission, Hidalgo County, TX, https://www.familysearch.org/ark:/61903/1:1:K36L-5P5. 7383. Lloyd Alan Bray, “Texas Birth Index, 1903-1997,” January 21, 1962, Hidalgo, TX, https://www.familysearch.org/ark:/61903/1:1:V8JH-BQC. 7388. “Obituaries,” Floyd Anthony Bray. KILLEEN, Texas — Floyd Anthony Bray, 73, died Oct. 11, 2005, at Bell Haven Nursing Center. Born on July 18, 1932 in Bradford, Ark. Mr. Bray was a truck driver for Reynolds Manufacturing Company in McAllen, Texas for many years before he retired. He was preceded in death by his parents and son Lloyd. Survivors include his sons, Scott (Alice), of Belton, Texas and Larry of Houston, Texas; daughters, Debbie (Bobby) Sherrill of Houston, Texas, and Connie (Jason) Huddleston of Mission, Texas; and their mother, Betty of Houston; Five grandchildren; and one great-grandson. No services will be held. His body was cremated. Killeen Memorial Funeral Home was in charge of arrangements. 7389. “Joe Pitts Bass, Sr,” Find-A-Grave, https://www.findagrave.com/memorial/157709386, 157709386. 7390. “Cynthia Anne Webb Bass,” Find-A-Grave, https://www.findagrave.com/memorial/157709764, 157709764. 7391. 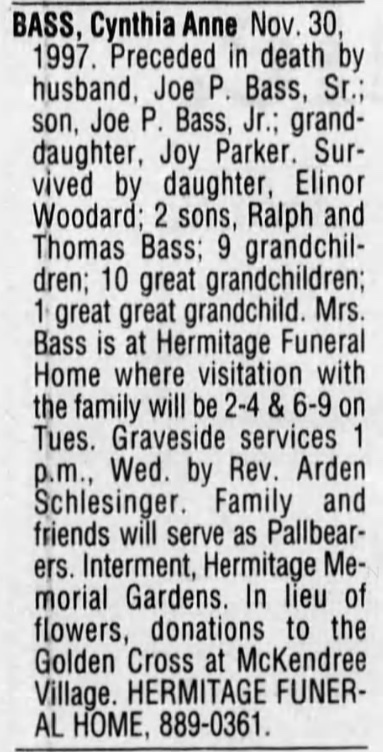 “Death Notices,” Cynthia Anne Webb Bass, The Tennessean, Nashville, TN, December 2, 1997, 3. BASS, Cynthia Anne Nov. 30, 1997. Preceded in death by husband, Joe P. Bass, Sr.; son, Joe P. Bass, Jr.; granddaughter, Joy Parker. Survived by daughter, Elinor Woodard; 2 sons, Ralph and Thomas Bass; 9 grandchildren; 10 great grandchildren; 1 great great grandchild. Mrs. Bass is at Hermitage Funeral Home where visitation with the family will be 2-4 & 6-9 on Tues. Graveside services 1 p.m., Wed. by Rev. Arden Schlesinger. Family and friends will serve as Pallbearers. Interment, Hermitage Memorial Gardens. In lieu of flowers, donations to the Golden Cross at McKendree Village. HERMITAGE FUNERAL HOME, 889-0361. 7392. 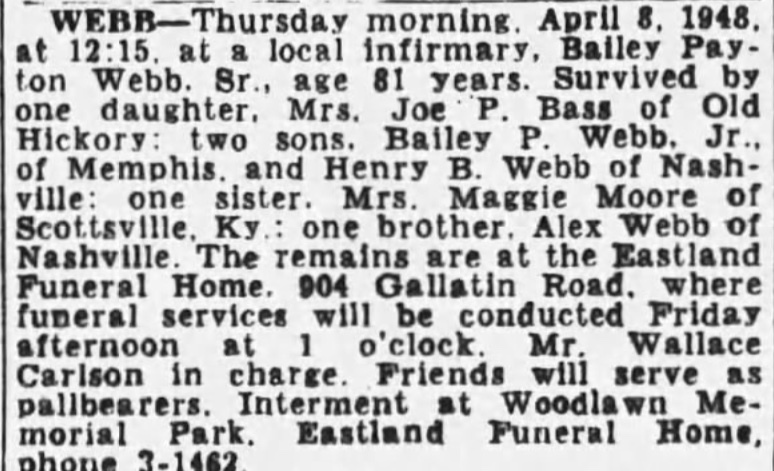 “Death Notices,” Bailey Payton Webb, The Tennessean, Nashville, TN, April 9, 1948, 6. WEBB—Thursday morning, April 8, 1948, at 12:15, at a local infirmary, Bailey Payton Webb Sr., 81 years. Survived by one daughter, Mrs. Joe P. Bass of Old Hickory; two sons, Bailey P. Webb, Jr., of Memphis, and Henry B. Webb of Nashville; one sister, Mrs. Maggie Moore of Scottsville, Ky.; one brother, Alex Webb of Nashville. The remains are at the Eastland Funeral Home, 904 Gallatin Road, where funeral services will be conducted Friday afternoon at 1 o’clock. Mr. Wallace Carlson in charge. Friends will serve as pallbearers. Interment at Woodlawn Memorial Park. Eastland Funeral Home, phone 3-1462. 7393. 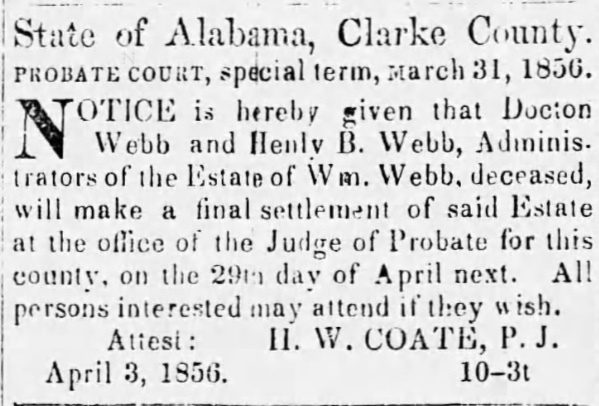 “Notice of Administration,” Wm Webb, The Clarke County Democrat, Grove Hill, AL, April 3, 1856, 3. State of Alabama, Clarke County. PROBATE COURT, special term, March 31, 1856. NOTICE is hereby given that Docton Webb and Henly B. Webb, Administrators of the Estate of Wm. Webb, deceased, will make a final settlement of said Estate at the office of the Judge of Probate for this county, on the 29th day of April next. All persons interested may attend if they wish. Attest: H. W. COATE, P.J. 7394. “Administrator’s Sale,” Sarah Webb, The Clarke County Democrat, Grove Hill, AL, October 8, 1872, 2. The E1/2 of sw1/2 sec 20. t 11 R 2 east. Oct1 ‘72is DOCTON WEBB Adm’r. 7395. “Administrator’s Notice,” Sarah Webb, The Clarke County Democrat, Grove Hill, AL, July 9, 1872, 3.
LETTERS of administration upon said estate were granted to the undersigned by the Probate Court of Clarke county, Ala.,on the 28th day of May, 1872. Notice is hereby given to all persons having claim against said estate to present them legally authenticated within the time allowed by law or they will be barred, and those indebted to the estate will make payment to the undersigned. 7396. “Chester L Parsons,” Find-A-Grave, https://www.findagrave.com/memorial/3197895, 3197895. 7398. “Annie L Parsons,” Find-A-Grave, https://www.findagrave.com/memorial/3197894, 3197894. 7399. George W Cofer and Martha C Parsons, “Tennessee, County Marriages, 1790-1950,” June 16, 1928, Williamson County, TN, https://www.familysearch.org/ark:/61903/1:1:QKHS-JT2V. 7400. 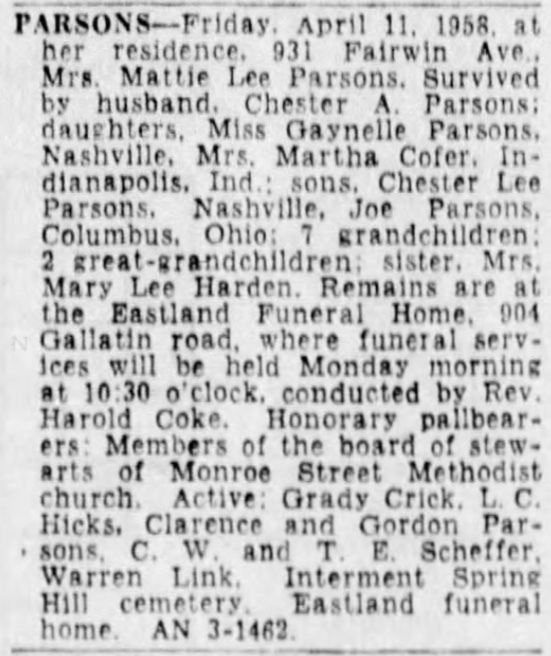 “Death Notices,” Mattie Lee Parsons, The Tennessean, Nashville, TN, April 12, 1958, 14. PARSONS—Friday, April 11, 1958 at her residence, 931 Fairwin Ave., Mrs. Mattie Lee Parsons. Survived by husband, Chester A. Parsons; daughters, Miss Gaynelle Parsons, Nashville, Mrs. Martha Cover, Indianapolis, Ind. ; sons, Chester Lee Parsons, Nashville, Joe Parsons, Columbus, Ohio; 7 grandchildren; 2 great-grandchildren; sister, Mrs. Mary Lee Harden. Remains are at the Eastland Funeral Home, 904 Gallatin road, where funeral services will be held Monday morning at 10:30 o’clock, conducted by Rev. Harold Coke. Honorary pallbearers: Members of the board of stewarts of Monroe Street Methodist church. Acive: Grady Crick, L. C. Hicks, Clarence and Gordon Parsons, C. W. and T. E. Scheffer, Warren Link. Interment Spring Hill cemetery. Eastland funeral home. AN 3-1462.